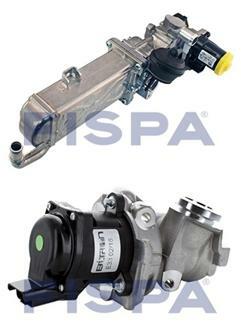 EGR valves are one of the major growth areas in the aftermarket at present and our FISPA range offers the perfect means to capitalise on this opportunity, offer excellent coverage, quality and value. EGR valves control play a vital role on most modern engines, helping to reduce emissions. However they can be prone to clogging and eventual failure. Rough idling, knocking and erratic engine performance can all be symptoms of a faulty EGR valve. Insufficient flow caused by carbon build ups. Problems with the Differential Pressure Feedback Sensor. Clogged Diesel Particulate Filter, carbon build up in the temperature sensor, or electrical issues. Excessive EGR system flow due to a clogged or dirty air filter, an intake leak, or turbo issues. Problems with the DPEE sensor. Issues with the EGR Control Back Pressure Transducer valve. Faulty EGR Valves will decrease engine performance and increase fuel consumption. If the issue is not resolved it can also cause damage to other systems and components. The FISPA range from ADE features replacement EGR valves for a comprehensive range of makes and models, all detailed on TecDoc. FISPA is a very well respect OE supplier and has over 25 years experience in this specialist field. Its high quality components are produced in ISO accredited factories and are competitively priced to offer big savings over dealer alternatives. For popular VW Group 1.6 & 2.0 TDI engines as used in Audi, Skoda, Seat and VW models. For popular 1.6 HDI engines as used in Citroen, Fiat, Ford, Mini and Peugeot models.